Why do we love this wine? Between you and me, I believe that once again we have brought you the SA Bomb of the year and you better brace yourself for impact. 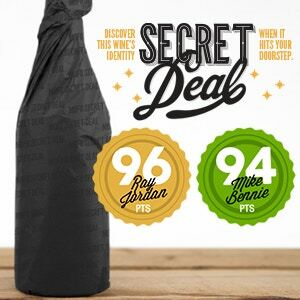 This 96 point McLaren Vale Shiraz is from an illustrious 5 red star producer and it’s 60% off. Now put that iPhone down and pay attention because this requires the most nimble of fingers. Trust me when I say that this is going to be a complete sellout. When you buy McLaren Vale Shiraz, you’re after savouriness, exciting chocolatey fruit and seamless flavours and tannin - and this, my friends, is the perfect expression of just that. We are massive fans of black cherries, dark spices and all the goodness in between in wines that just fill your entire mouth with balanced and rich flavours. If you love South Australian reds and everything about them, go absolutely no further because this is an incredible deal on one of our favourite Shirazes. It’s cool, we get it, you want to know absolutely everything about this wine. Well here you go, go nuts. McLaren Vale is a region that lives in the shadow of the hype of the Barossa. While it has played on Shiraz as its drawcard, and continues to battle (quite rightly) with the supreme power of the Barossa, perhaps the most exciting wines from this region are its old vine Grenache and Mataro (Mourvedre/Monastrell - whatever you want to call it), and its more recent foray into Spanish and Italian varietals. Both the sun's warmth and the reliable salty afternoon gully breeze make the climate closer to Mediterranean than many other Aussie regions, and some of the Fiano, Vermentino, Tempranillo and Sangiovese from here are sublime (to name only a few). Awareness, proper consideration and sense of place are key attributes to the region's success, and its recent win against urbanisation reinforces the value of the viticultural region. Preheat your oven to 180ºC/350ºF/gas 4. Put a casserole pan on a medium heat, add a splash of olive oil then cook the bacon, rosemary, garlic and onion for about 5 minutes, stirring now and then, until soft. Add the mince and break apart any lumps with a wooden spoon. Let it cook for a couple of minutes until starting to brown then pour in the red wine. Let that bubble away while you drain and blitz the sun-dried tomatoes in a food processor. Add them to the mince with the tinned tomatoes. Stir well and break the plum tomatoes apart a little. Cover with a lid then cook in the hot oven for 1 hour. Remove the lid after 30 minutes, and if it looks a little dry, add a splash of water to help it along. About 10 minutes before the time is up, cook the spaghetti according to packet instructions. Drain, reserving a mugful of cooking water, then return the spaghetti to the hot pan with a few spoons of Bolognese, a good grating of Parmesan and a drizzle of extra virgin olive oil. Mix it about to coat the spaghetti and to stop it becoming claggy, loosening with a splash of cooking water if needed. Divide the spaghetti between your plates or bowls, add a good spoonful of Bolognese to each one then shave over a little Parmesan before serving.